This feature supplements the safety belt warning function by providing additional reminders by intermittently sounding a chime and illuminating the safety belt warning light when the driver’s or front passenger’s seat is occupied and the safety belt is unbuckled. The system uses information from the front passenger sensing system to determine if a front seat passenger is present and therefore potentially in need of a warning. To avoid activating the Belt-Minder feature for objects placed in the front passenger seat, warnings will only be given to front seat occupants as determined by the front passenger sensing system. 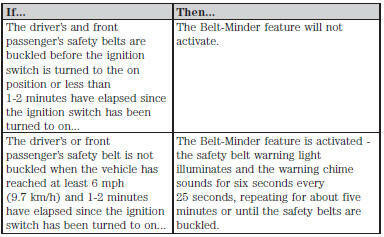 If the Belt-Minder warnings have expired (warnings for about five minutes) for one occupant (driver or front passenger), the other occupant can still activate the Belt-Minder feature. While the design allows you to deactivate your Belt-Minder, this system is designed to improve your chances of being safely belted and surviving an accident. We recommend you leave the Belt-Minder system activated for yourself and others who may use your vehicle. To reduce the risk of injury, do not deactivate or activate the Belt-Minder feature while driving your vehicle. Note: You can activate and deactivate the driver and front passenger Belt-Minder independently. When deactivating or activating one seating position, do not buckle the other position as this will terminate the process. Read Steps 1 - 5 thoroughly before proceeding with the programming procedure. Note: If you are using MyKey, you cannot disable Belt-Minder. Also, if the Belt-Minder has been previously disabled, it will be re-enabled during the use of MyKey. See the MyKey chapter. You can activate and deactivate this feature by performing the following procedure: Before following the procedure, make sure that: • The parking brake is set. • The transmission is in park P.
• The ignition is off. • The driver and front passenger safety belts are unbuckled. 1. Switch the ignition on. Do not start the engine. 2. Wait until the safety belt warning light turns off (about one minute). 3. Wait 10 seconds after the safety belt warning light turns off. • Step 4 must be completed within 20 seconds after the completion of Step 3. 4. Buckle then unbuckle the safety belt three times at a moderate speed, ending in the unbuckled state. • After Step 4, the safety belt warning light will turn on for three seconds. 5. Within about seven seconds of the light turning off, buckle then unbuckle the safety belt. The safety belt warning light will blink. • This will disable the Belt-Minder feature for that seating position if it is currently enabled. • This will enable the Belt-Minder feature for that seating position if it is currently disabled.